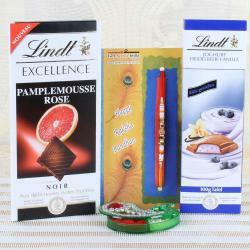 Product Consist: Lindt Heldelbeer-Vanille Chocolate (Weight: 100 gms), Lindt Excellence Caramel Chocolate (Weight: 100 gms), Lindt Lindor Coconut Chocolate (Weight: 200 gms), Zardosi Rakhi, Rakhi Greeting Card along with Roli Chawal Container. 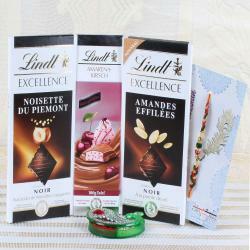 Are you searching for the best combination of Rakhi and Chocolate gift hamper for your loved one? Then you are at the right place. This leading online portal will provide you a huge range of Raksha Bandhan gifts and Raksha Bandan chocolates for your loved onea. 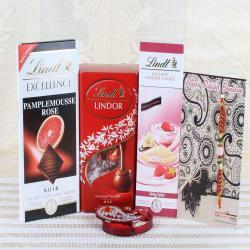 Buy Yummy Lindt Chocolate and gift it to your brother on Raksha Bandhan. 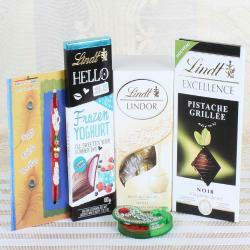 Chocolate is one of the best gifts for your brother on Raksha Bandhan to strengthen your relationship. Presenting a Raksha Bandhan gift to your brother can create long lasting bond of memories that can be cherished for all years to come. Buy the chocolates and rakhi online and create everlasting memories. 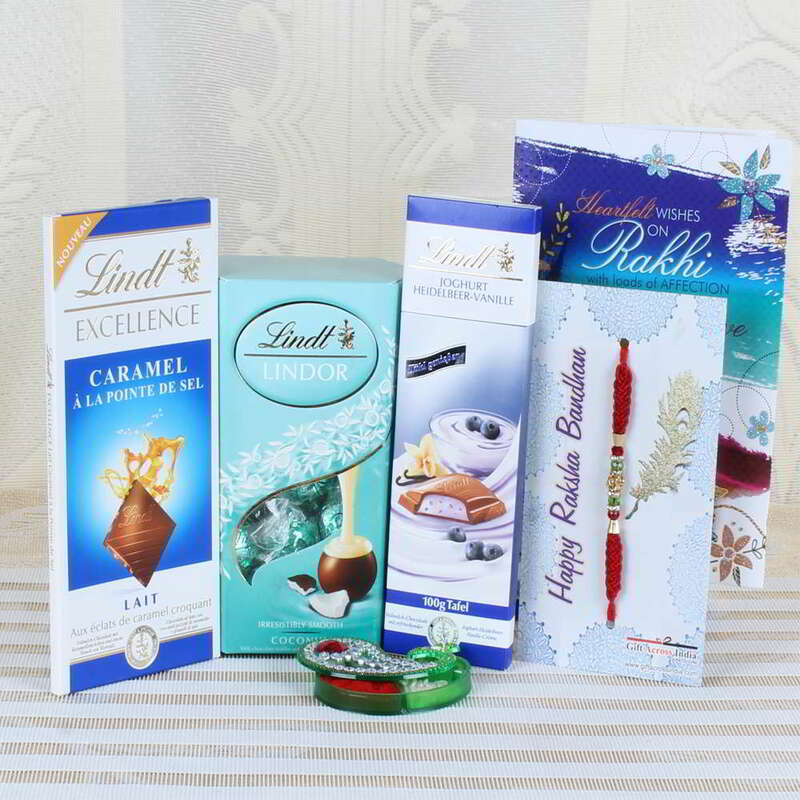 Product Consists of: Lindt Heldelbeer-Vanille Chocolate (Weight: 100 gms), Lindt Excellence Caramel Chocolate (Weight: 100 gms), Lindt Lindor Coconut Chocolate (Weight: 200 gms), Zardosi Rakhi, Rakhi Greeting Card along with Roli Chawal Container.